If you saw my last post you will know I had a couple of Faux Watercolour pieces to play with. In case you missed it you can check it out here. These are the two pieces I had to work with. And now what did I make? This card was made with Calypso Coral Card base. Whisper White Matt. I ran a piece of Pink Pirouette card stock through the Woodgrain Embossing Folder which I had inked with Calypso Coral Ink. I cut this embossed piece into three pieces and mounted it on a piece of Black card stock. I cut the watercolour background out with the circle framelits and mounted it on to a black piece of card. The Stamp is from the Wetlands Stamp set. Flowers are from Petite Flowers which are decorated with Candy Dots. The greeting is also from Wetlands Stamp Set. I also added dazzling diamonds to the picture. This is the second card I made. One of the challenges I did earlier this year was to make a card with the faux watercolour technique. This is where you colour a Clean Acrylic Block with Stampin Write Markers. Spritz the block with water and then stamp it onto Watercolour Paper or Whisper White. I thought it would be fun to try a rainbow type effect. Here are two cards one using Watercolour Paper and one using Whisper White. 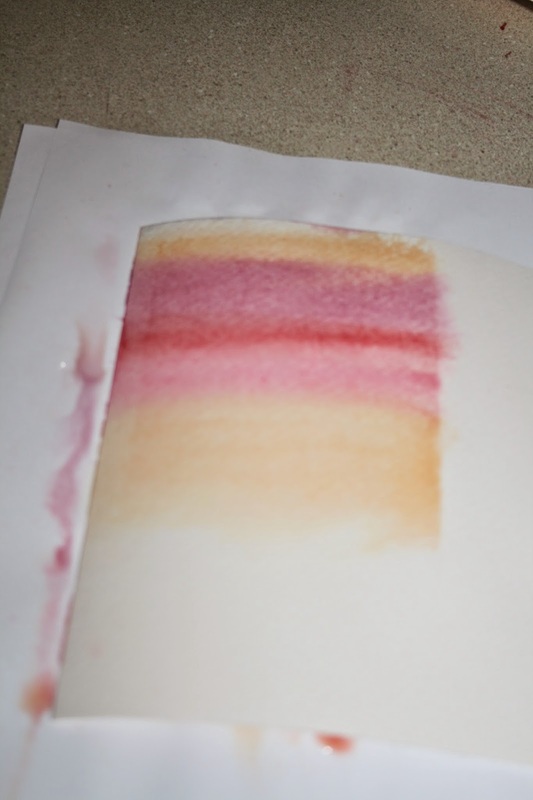 You can see how the water soaked in to the Watercolour Paper much more creating an entirely different look. 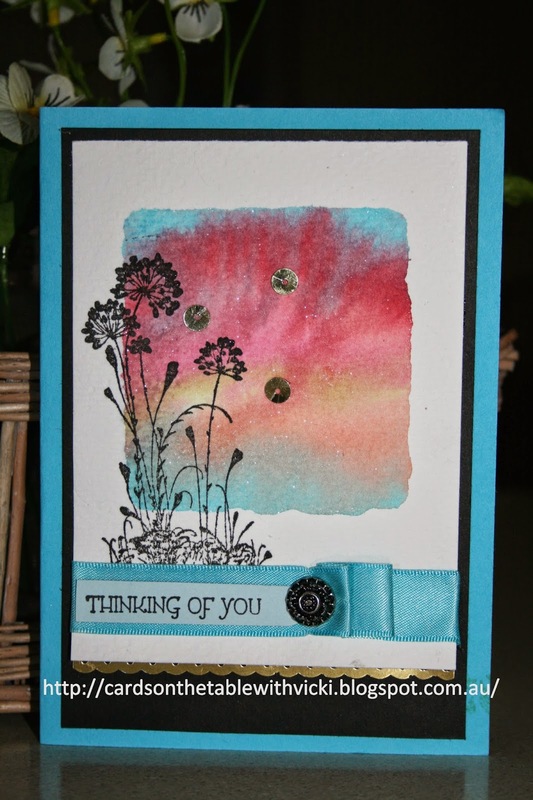 For this first card I used Serene Silhouettes Stamp Set from the main catalogue. I had some fun with gold sequins too. Here are a few photos to show you how I did it. Markers, clean block (any size) and spritzer. Colour in block. Remember that the colours will be softer and watered down so you can use quite strong colours. Spritz block. You can also spritz your paper lightly as well for a different look. Turn block over and stamp. hohoho Up a Gum Tree. If you saw my last post you will know that I made some really cute little punch art Koalas. The idea for them originally came from a fellow demonstrator Pat Carr. I fell in the love with them so much I just had to bring them into a Christmas Card. So what did I use this time? Real Red Cardstock base. All is Calm designer Specialty Paper. Wild Wasabi Cardstock cut with On Film Framelit. Santa Hat is triangle and scalloped edge glimmer card is from Petite Pennants Builder Punch in real red card stock with silver glimmer card and little pom pom on top from the Itty Bitty Shapes retired punch (you could easily replace this with a small circle shape). Pisatchio Pudding Cardstock for leaves sponged with Wild Wasabi ink. Leaves cut from retired SU Secret Garden Framelit and Bird Builder Punch. 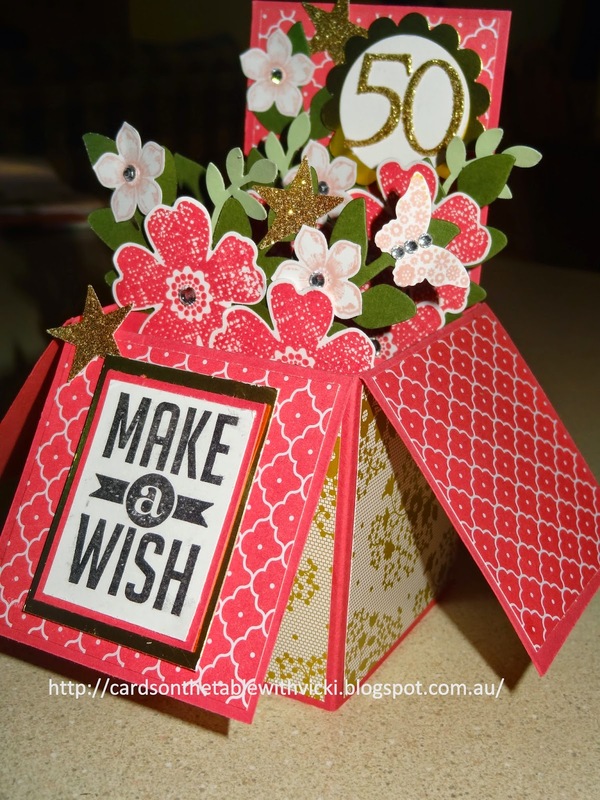 Little red Glimmer card flowers punched with retired SU Itty Bitty Shapes Punch. Give me a home among the Gum Trees. G'day Mate! yes I am waving the Aussie Flag today. Why? 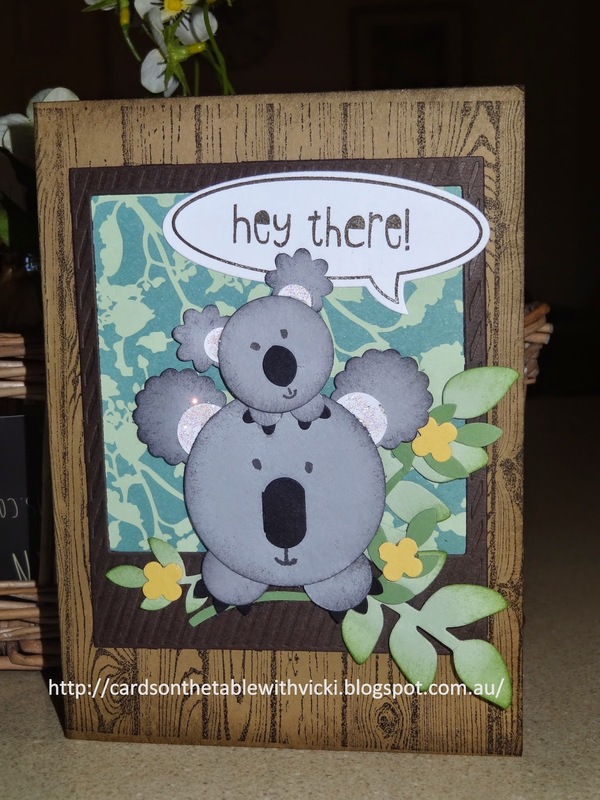 Because I have made a cute Koala Card that I just can't wait to show you! I found the cute idea for the punch art koalas on Pinterest. 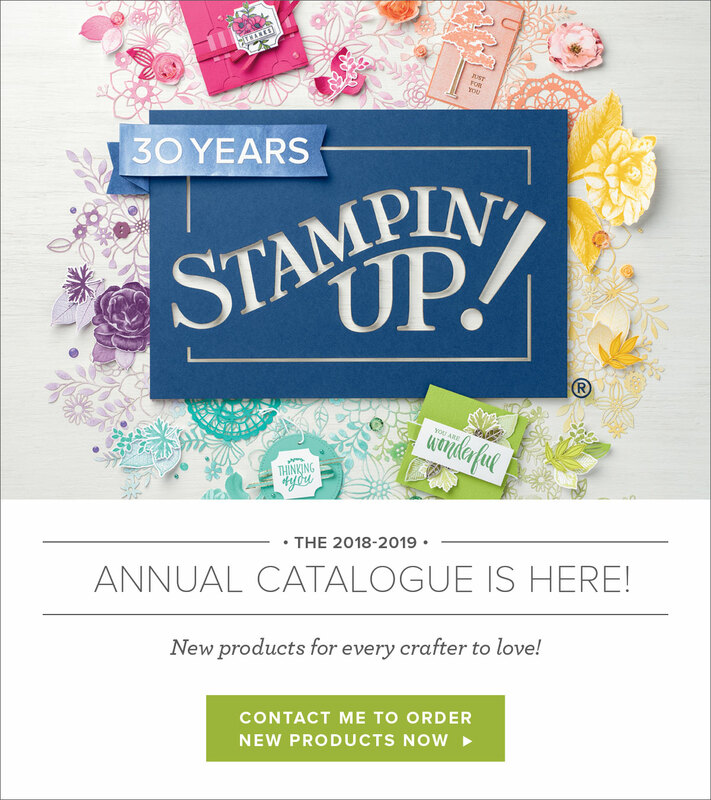 It was from a clever Stampin Up Demonstrator Pat Carr. Unfortunately I don't think Pat has a blog so I can't link to her. Let me de-construct the card for you. The base card in Brown Sugar with the Hardwood Background Stamp in Early Expresso ink. I used the On Film Framelits for the frame in Early Expresso Cardstock. The word "hey there" is from Just Sayin Stamp Set and I used the Word Bubble Framelits to cut it out. 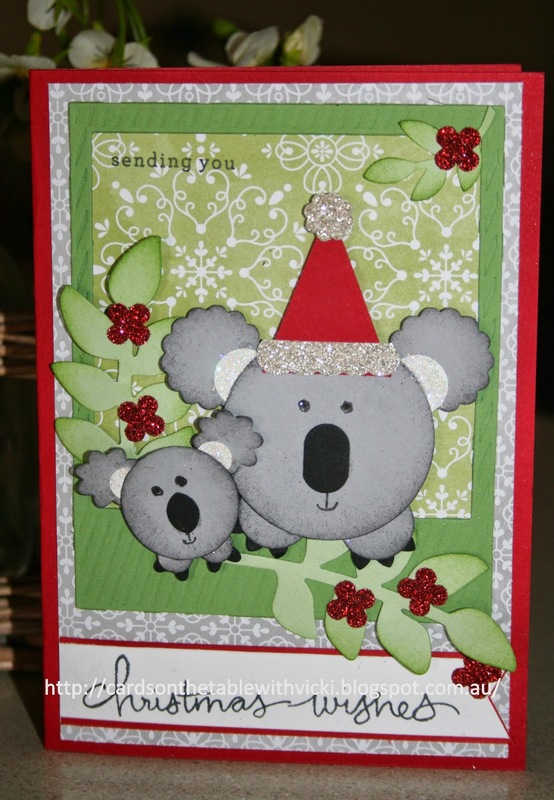 I used Smoky Slate for the Koalas and inked the edges with Basic Grey. I also added some DazzlingDiamonds to the white parts of the Koala ears. Fast Card in the Box. OK so I know you are groaning now. Not another Card in the Box?! But really, I was time poor and had to come up with something "special" fast, so I turned to the trusty Card in the Box. So how did I make a fast version of this card? I already had some small flowers and a butterfly stamped in Blushing Bride lying on my table so I picked colours to compliment them. Strawberry Slush, Blushing Bride and Gold. The box was made in Strawberry Slush Cardstock. I used Designer paper from the All Abloom Paper Stack and Gold Soiree Designer Paper to decorate. I stamped lots of flowers (5) from Flowershop Stamp set in Strawberry Slush and punched them out. Then I used my retired Secret Garden framelit for the Mossy Meadow leaves (5) and Pistachio Pudding Bird Builder Punch leaves (3). The "50" was made using a non-SU product with gold glimmer card stock and framed with Gold Foil punched with the Scallop Circle Punch. Another Card in the Box! Yes sirree! 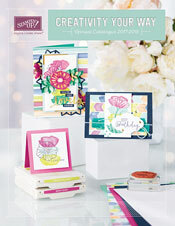 I am having a Card in the Box Extravaganza at the moment! Actually we have had a super busy few weeks with lots of special events and birthdays to keep me occupied. Yet another special birthday event. Yet another Card in the Box Opportunity I say. haha. Unfortunately I had to take these photos at night and I never get as good a photo without natural daylight. But you can still get the idea of how it looked. I used the Crisp Cantaloupe with the Gold Soiree Specialty Designer Paper for the box. Flowers are using the Pansy Punch and Flowershop Stamps. Colours: Crisp Cantaloupe, Calypso Coral and Coastal Cabana. Leaves are from retired Secret Garden Framelits in Pistachio Pudding and Butterflies in Calypso Coral. 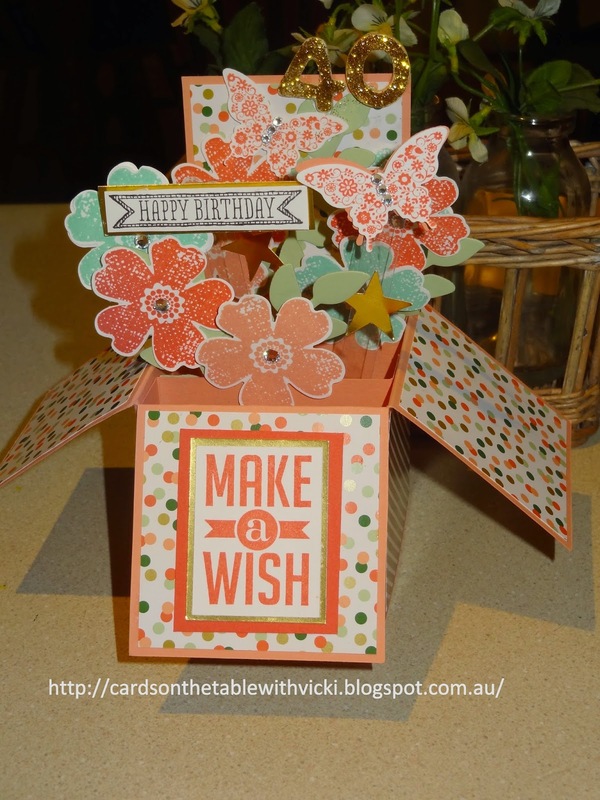 Make a Wish from Perfect Pennants Stamp Set and Happy Birthday from Itty Bitty Banners. The number 40 is non SU. Just a couple more photos for you. Have a great week and I will catch up with you in a few days time with another birthday card.